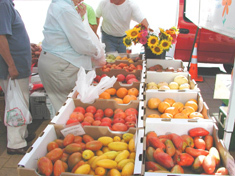 Enjoy Worthington's picturesque streetscape while you shop for fresh, local Ohio grown seasonal fruits and vegetables interspersed with flowers, plants and homemade foodstuffs that vendors display on downtown sidewalks. Linger at historic Worthington's outdoor eateries and discover quaint, downtown shops offering unique clothing, gifts and collectibles. Use convenient parking behind the Worthington Inn and the Methodist church just one block south of the intersection of Routes 23 and 161.